They’re great for sharing with friends or when the family pop over. This one keeps for up to 3 months in the fridge, and you can enjoy it on many meze platters, or on its own with roasted potatoes & lemon, with a salata (salad), or with a good loaf of bread. Make sure to mop up all those yummy juices with your bread! In a pan, toast the black peppercorns, chilli flakes and bay leaves over medium-high heat until they are fragrant, for about 1 minute. Place them in a small saucepan with oregano, smoked paprika, garlic and vinegar. Bring to the boil, then simmer on your lowest setting for 2 minutes, remove from heat and set aside, covered. Bring a pot of water to the boil. Once it’s boiled turn off the heat, pop the baby octopus in for 1 minute and drain immediately afterwards. I like to twice cook my octopus, so I pop them over hot coals, and char grill them for a few minutes. It adds so much flavour. If you don’t have coals, you can put them on the gas BBQ; grill on highest heat for a few mins until charred a little. 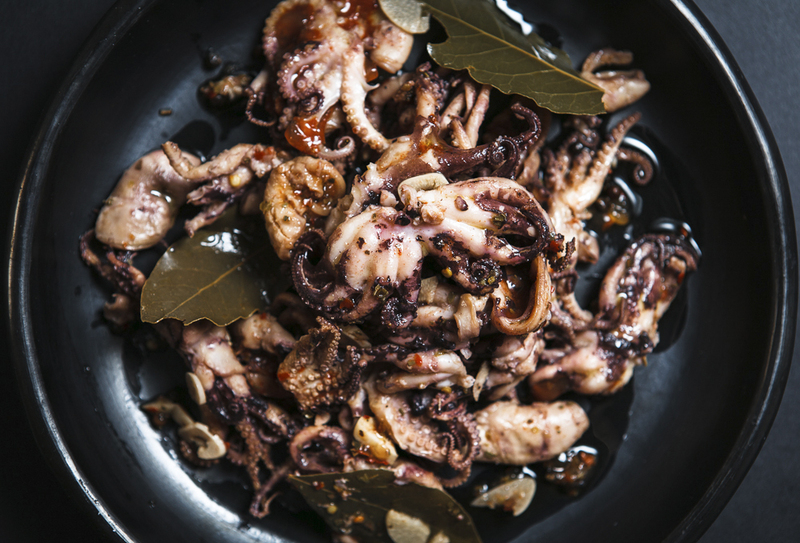 Pop octopus in your sterilised jar, pour warm vinegar over the octopus, and then immediately top with olive oil. Cool to room temperature then refrigerate for 1 week before eating. Serve room temperature with lemon wedges. * Dried Greek mountain oregano (Rigani) is found in most Mediterranean grocers. It usually comes in a long package about 30cm, the flower tops and leaf cuttings of the plant are harvested whole. All you have to do is squeeze the bunch a little with your hand to release it from its twig - you can use normal oregano if you cannot find the good Greek stuff! Oktapodi Toursi (Greek Pickled Baby Octopus) components ready to assemble! Cleaned baby octopus, bay leaves, garlic, smoked paprika, chilli flakes and peppercorns. Photograph by Hugh Adams, styling by Cle-ann.